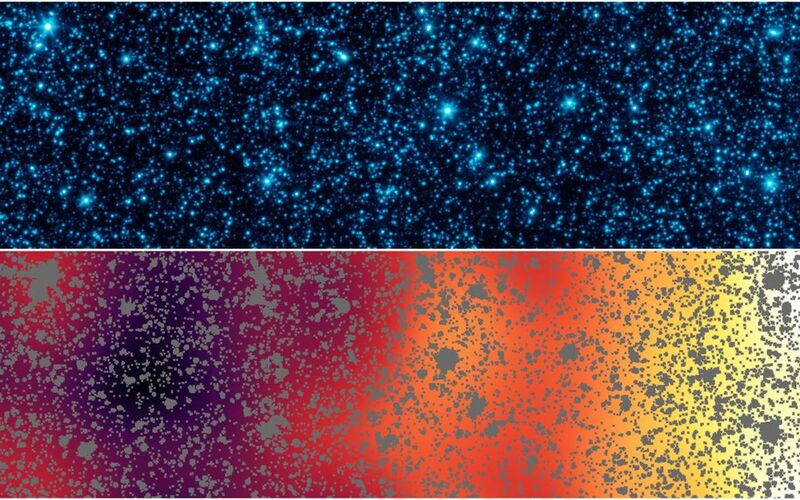 Astronomers have uncovered patterns of light that appear to be from the first stars and galaxies that formed in the universe. The light patterns were hidden within a strip of sky observed by NASA's Spitzer Space Telescope. These two panels show the same slice of sky in the constellation Boötes, dubbed the "Extended Groth Strip." The area covered is about 1 by 0.12 degrees. 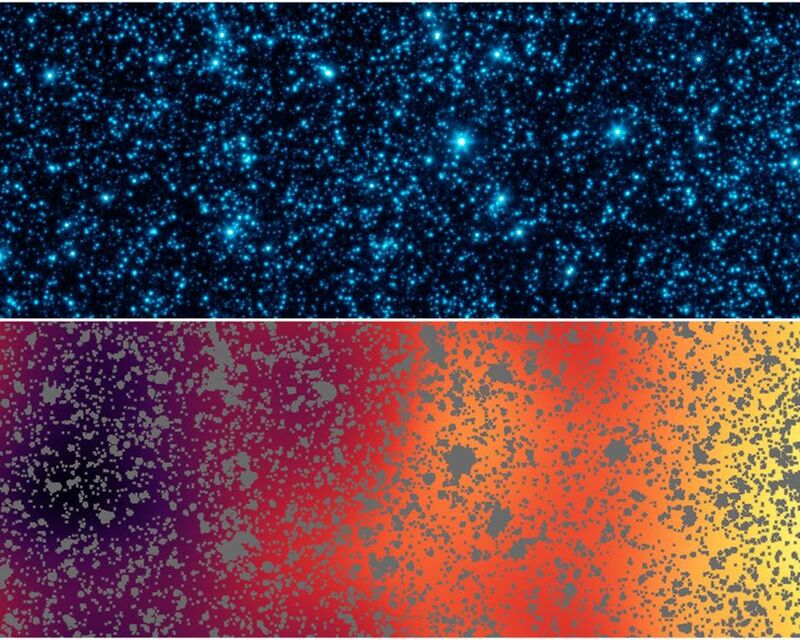 The top panel shows Spitzer's initial infrared view of this patch, including foreground stars and a confusion of fainter galaxies, seen at a wavelength of 4.5 microns. In the lower panel, all of the resolved stars and galaxies have been masked out of the image (grey patches), and the remaining background glow has been smoothed and enhanced. This processing reveals structure too faint to be seen in the original image. 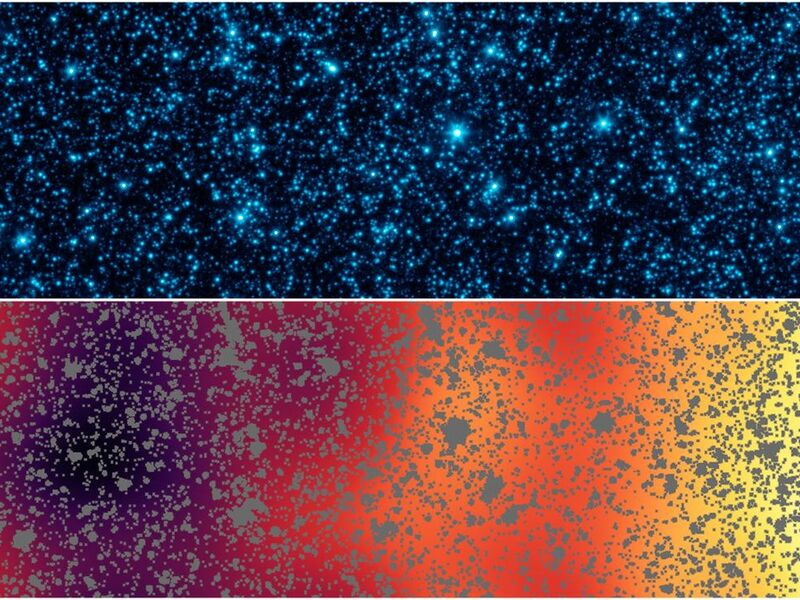 The structure of the lower panel matches just what we would expect for the patterns of clusters from the first galaxies formed in the universe. Even though any particular early galaxy would be too faint to see individually, this technique allows astronomers to better understand what things were like shortly after the Big Bang.